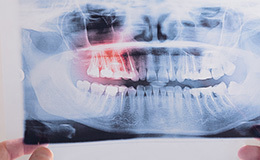 Our team strongly recommends that patients undergo a wisdom tooth evaluation by their mid-teenage years. This process can be performed by their general dentist, an orthodontist, or an oral and maxillofacial surgeon like Dr. Moreland. Countless studies have shown a clear link between early evaluations and successful outcomes for a patient’s health and wellbeing! 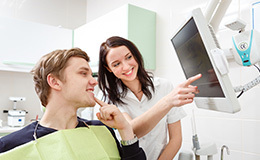 Through a dedicated oral examination and comprehensive X-rays, the position of these teeth can be determined, and predictions can be made regarding any future concerns or damage that may occur. Interested in learning more? Don’t hesitate to contact our St. Louis, MO specialty surgical office. The most common issue that arises from wisdom tooth impaction is the development of pericoronitis. This is a localized gum infection that occurs when there isn’t enough room for proper eruption. The soft tissue becomes irritated and infected, resulting in unpleasant symptoms like improper chewing/swallowing, swelling, and chronic pain. 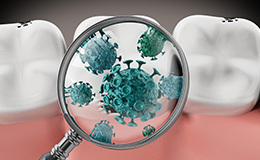 Impacted wisdom teeth can lead to dangerous overcrowding, most likely in the lower front teeth. This typically occurs after a patient has undergone orthodontic treatment and reached early adulthood. 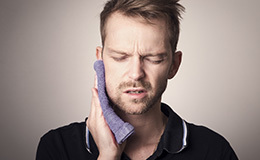 This is why Dr. Moreland may recommend wisdom teeth removal even if the patient is currently experiencing no pain or symptoms – we want to avoid the possibility of long-term damage to the oral structures in the future. 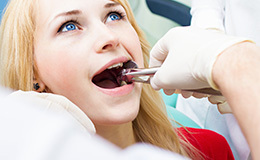 The arrival of wisdom teeth can create inadequate space to properly clean the surrounding teeth. As a result, patients can experience a higher risk of gum disease, bone loss, and gradual tooth decay/cavities. 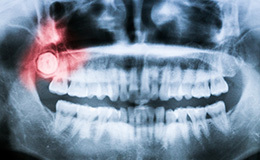 Cysts are fluid-filled “balloons” that develop inside the jawbone because of impacted teeth. Over time, they will expand in size, causing significant damage to not only the jawbone, but the natural teeth as well. If a patient’s wisdom teeth aren’t removed when they are a teenager, it can make cyst treatment extremely difficult. The formation of tumors may also be a possibility, although this is definitely a rare outcome. What If I Don’t Have My Wisdom Teeth Removed When I’m a Teenager/Young Adult? 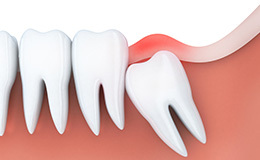 As the wisdom teeth gradually develop, their roots will become longer. Additionally, the jawbone’s structure will become denser. When Dr. Moreland evaluates patients in their thirties or forties for wisdom tooth removal, they often require prolonged post-operative care and experience a much higher rate of general complications. The course of treatment is usually also unpredictable – healing may occur at a slower pace, and there’s a higher risk of infection, too. If the wisdom teeth are completely impacted in the bone, it may be wiser to wait until a more serious problem (such as the formation of a cyst, the significant loss of bone, or gum disease) develops. That’s why our team strongly recommends that families plan for wisdom teeth removal when the patient in question is relatively young. When having wisdom teeth surgically removed, many people prefer to be completely unaware of the experience. During your first consultation, our team will review your anesthesia/sedation options with you in full so that you can select the one that best fits your situation. Rest assured that our team has the extensive training, licensing, and overall experience needed to provide various types of anesthesia in an outpatient setting. We also use state-of-the-art monitoring equipment to ensure complete safety! Our facilities, our team, and Dr. Moreland are regularly inspected by the Board of Dental Examiners to ensure that these standards are met. When you arrive at our St. Louis practice for your procedure, we will first provide medication to help minimize any pain or swelling that could occur. You should be accompanied by a parent, a friend, and/or another responsible adult that can drive you to the office and stay with you for the rest of the day following the procedure. In most cases, we will be finished in under an hour with the removal, and patients will only need to be within the office for 90 minutes at most. Today’s advanced tools and techniques (coupled with modern sterilization/infection control) help patients experience faster healing and less post-operative discomfort than ever before! Please make sure that before your surgery, you have NOTHING to eat or drink (excluding any prescription medications with small sips of water) for at least six hours – preferably longer. Having excessive food and liquid in your stomach can result in anesthetic complications, including vomiting or general nausea. If we discover that you have not followed these guidelines, our team will be forced to reschedule your procedure. Please do not consume dairy products (milkshakes, yogurt, etc.) on the day of your surgery. Their combination with the anesthesia or pain medication may result in strong feelings of nausea. Also, you may be prescribed to take antibiotics, which can often make birth control pills ineffective, so please take the appropriate precautions. During your initial consultation, Dr. Moreland will also write a prescription for pain medication (if needed) that can be filled in advance of the procedure. Once you’re settled in the surgical room, we’ll do everything in our power to help you feel as comfortable as possible. If you have opted for sedation, we will place the IV in your left arm to deliver the necessary medication. Please keep in mind that you will likely feel sleepy for the rest of the day following sedation, so rearranging your schedule to accommodate this downtime is important. If your wisdom teeth surgery ends up requiring stitches, Dr. Moreland will typically use dissolving sutures so that you don’t have to attend a separate appointment for their removal. 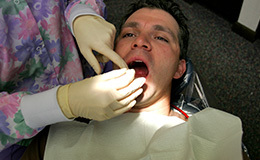 Patients may experience the general feeling of their gum tissue pulling away from the teeth and swelling. Don’t panic – this is a normal part of the healing process and should subside within a few days. Once your local anesthesia has fully worn off, prescription pain medication should be used as directed. We suggest using non-narcotic, anti-inflammatory medications, such as ibuprofen (Advil) first. If this doesn’t provide the pain relief that you need, it’s okay to try other medications. Also, keep in mind that the local anesthesia’s effects may last into the following day – this shouldn’t be confused with a serious nerve injury. For your immediate post-operative diet, stick with clear liquids like broths or Jell-O. What Does Wisdom Teeth Removal Cost? Will My Insurance Cover It? Every patient’s case is different, and your overall fee will be determined by several unique factors, including how tricky it will be to extract the tooth and which type of anesthesia is the best fit for your needs. During your initial consultation, Dr. Moreland will fully review your X-rays, complete a full examination, and help you determine the right anesthesia choice. Then, we can provide a confident estimate! 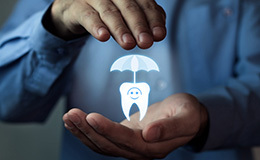 Every insurance provider has different policies regarding the extent of their coverage for oral surgery. We’ll be happy to help you file any claims and maximize your reimbursement for wisdom teeth removal or other likeminded procedures so that the payment process is as stress-free as possible. What if I Have Questions Before My Wisdom Teeth Surgery? During your consultation, our team will be sure to discuss your specific needs and answer any questions with as much detail as possible. Please don’t hesitate to speak up with any concerns! If you think of new questions after this visit, please contact us in St. Louis as soon as possible to speak to a patient care coordinator.